Once a newsletter has been sent it should not be left as an autonomous piece of communication, but it ought to be sent into online circulation. Integration between newsletters and social media is key and a setting up a share button in your newsletter is just one of the things you can do. It is all about creating a balance between your media channels, since social media can be used to collect permissions. Furthermore, it has also become easier to be up to date with newly released material. 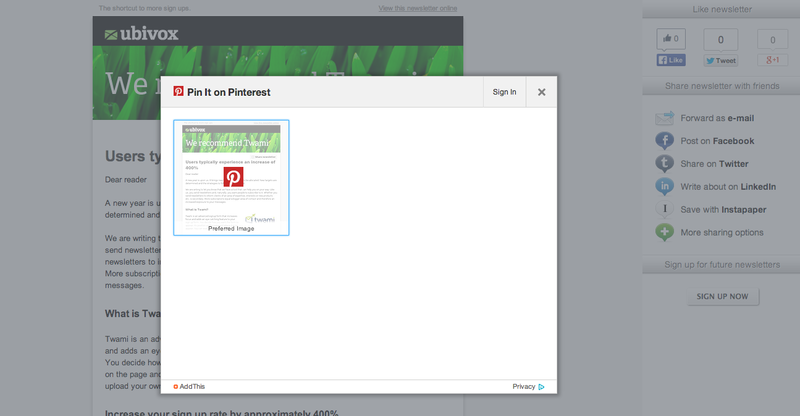 For example, Pinterest gives you a notification when someone has made an interaction on one of your boards. With social sharing you have the possibility of sending your newsletter on a longer journey than usual. Through this you can experience how it generates additional awareness, feedback and additional content, since social media enable user interaction. All of this can increase your sales in for example your web shop, sine it increases your visibility and thereby reach. 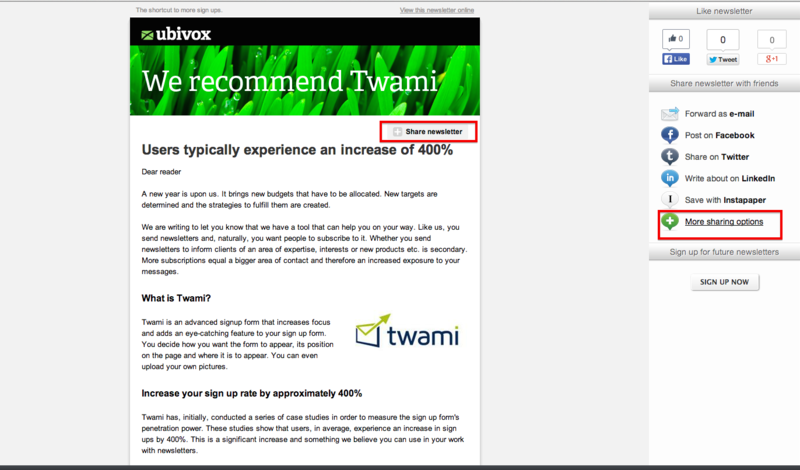 Besides giving you the possibility of having a newsletter archive on your website in Ubivox, social media sharing is an advice that underlines that all kinds of newsletters can be used in a different context, while maintaining their value. On the social media platform Pinterest.com you can share original content and create your own Board where you share this content. A Board can be made for personal use, but you can also create a public business board, which gives your company a public profile on Pinterest. You can use this as an online branded notice board. On this notice board you can create an archive to your newsletters – fast and easy. 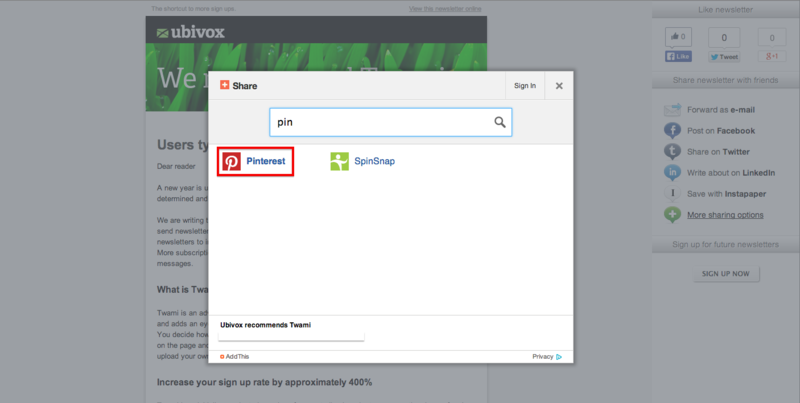 You can now ‘Pin It’ on Pinterest by clicking at the image. Choose the Board you wish to link it to and complete by clicking at the button Pin it. 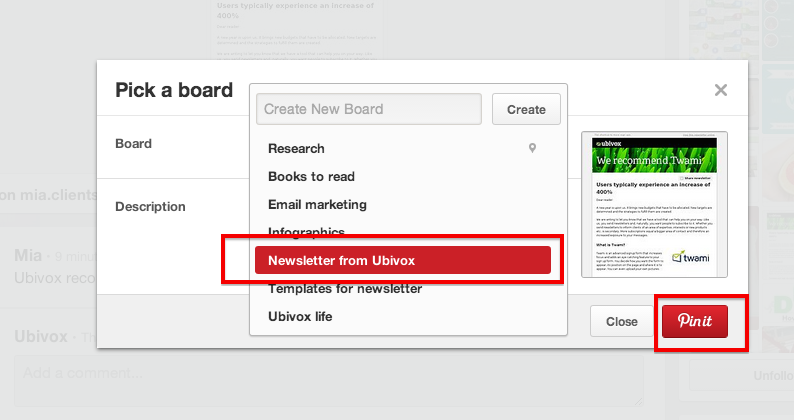 You have to make a new Pin for every newsletter you wish to share, write a comment and then categorize it on your board. You can also Pin other peoples post to your board if you wish. This can create professional contacts. 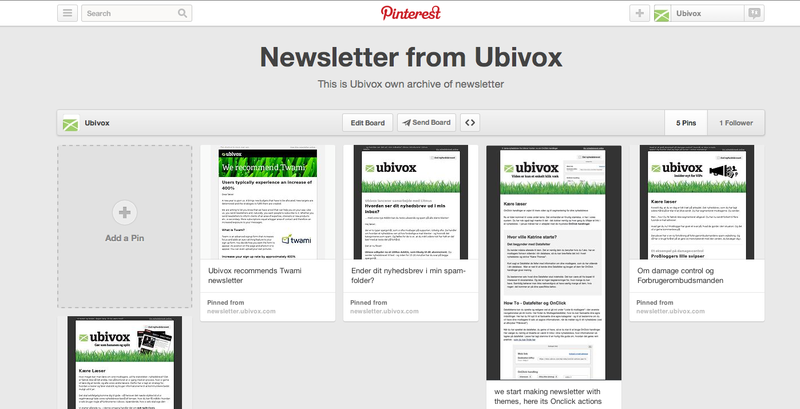 Through Pinterest and social media sharing you can increase your sign up rate, since new subscribers can see your newsletters even though they did not receive the one you sent through Ubivox. You can also increase your reach by naming your Pinterest boards with relevant titles. Click here to see how we use Pinterest.